The physical trumpet is an expensive and beautiful work of art. As a musician, it is your duty to keep it clean, working, and in good repair. The following should help you to keep your instrument in good condition. The valves and pistons on a trumpet are very delicate—and essential. The casing should always be free of dents, and the pistons should be kept well oiled. Any commercial valve oil, such as those sold in music stores and pictured at the right, will work. The valves should be oiled at least once a week, and usually more often. When the valves become sluggish, it is time to oil. The best way to oil your valves is to remove the pistons from the casing. First, unscrew the cover on each of the valve caps, and lift the valves straight out. Pay attention to where the number stamp is located so that you can return it with the number stamp facing the same direction. Apply the valve oil liberally, getting a good coating on them. When replacing the pistons, put them into the casing about half way and then rotate them back and forth, to spread the oil around evenly. When done rotating, line up the valve in the casing according to the brand of trumpet you have—most require that you have the numbers that are stamped on each piston to be facing you when inserted. You will feel the piston “sit” into place, and then you may re-tighten the valve caps. Slides are bare metal. They need grease to be applied to them to keep them moving properly, otherwise, they could freeze. Valve grease can also be obtained from many music stores for a small cost. It takes only a very small amount of grease to work. First, remove all of your slides– the valve slides and the main tuning slide. With your finger, place a small amount of grease on the part of the slide that is thinner and fits inside a larger piece of tubing. Spread the grease evenly all the way around the slide, and then reinsert only one of the tubes back into place, rotate around, and repeat with the other side. Once both sides have been rotated in the tubing, the slide can be replaced normally back onto the trumpet. Shining your instrument is easy. Simply take a polish cloth and buff the surface to keep your instrument shiny. Do NOT try to take out dents yourself—it requires special tools and training to have the desired effects. If you have dents, dings, or scratches take the instrument to school so it can be repaired. If your instrument has become difficult to blow air through and you’ve checked to make sure that the valves are aligned properly and the instrument is not damaged, you may need to clean your instrument. Be very careful as you work to ensure that you do not damage the instrument. If anything does not come off easily DO NOT remove it, continue as though you had and then take the instrument to school or to a qualified instrumental repair person to be fixed. To clean your trumpet, like a clean bathtub with a towel. Then run lukewarm water into a clean bathtub. 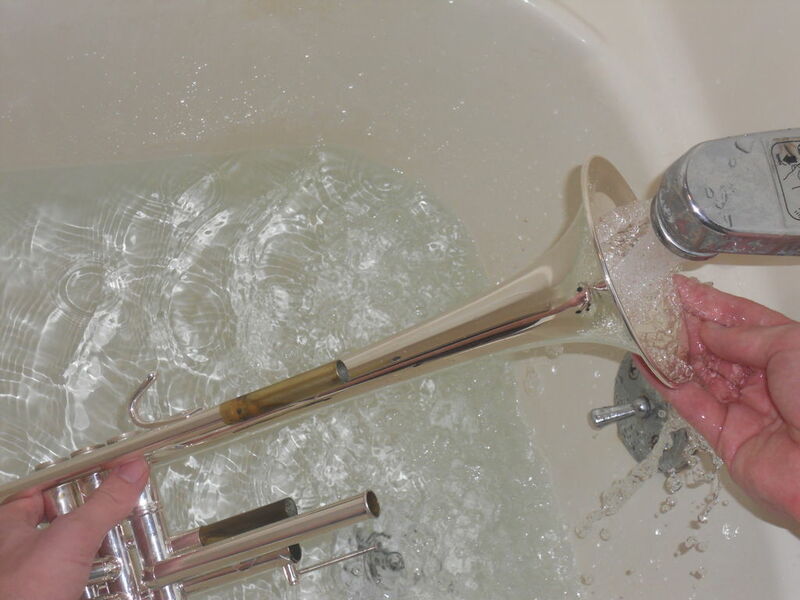 Do NOT use hot or cold water, as extreme temperatures can sometimes damage your instrument. Add about one tablespoon of dish soap to the water. Turn the water off when there is enough water to just cover your trumpet. Begin taking your trumpet apart. Remove the mouthpiece and place it in the water. Gently remove the tuning slide and valve slides and place them in the water. If any of these slides are stuck, do not use force to free them, continue cleaning the trumpet without removing them and either return the instrument to school or take it to a qualified instrument repair shop for removal. As you remove each slide, clean off any excess slide grease or other residue with an old dish rag. Next, fill the plastic cup with soapy water from the bathtub just deep enough so that the water will cover the valve but not touch the felt. Starting with the 1st valve, unscrew the valve nut and gently pull the valve straight up until it is halfway out. There should be a number “1” stamped somewhere on the valve. Locate the number and take note of which direction the number faces. You may even want to write it down. When you reassemble your valves, the number will have to be facing the exact same way. Continue to pull the valve straight up and out of the valve casing. Place the valve into the plastic cup. Take the second and third valves out in the same manner. Once removed, place each valve into the plastic cup. Finally, remove the valve caps from the bottom of the valve casings. Again, don’t use excessive force if they are stuck. You can clean the trumpet with them still on and have a repair shop loosen them later. Place the valve caps into the tub. Now that your trumpet has been taken apart and is in the soapy water begin cleaning it with the brushes. On the valves use your valve casing brush to clear the holes in each valve of any grime and buildup that may be interfering with airflow. Don’t worry about discoloration, but be careful not to scratch or mar the surface of the valve as that will prevent the valve from moving properly. Gently brush and clean each valve, rinse it off and set it aside on a clean, dry towel for assembly. 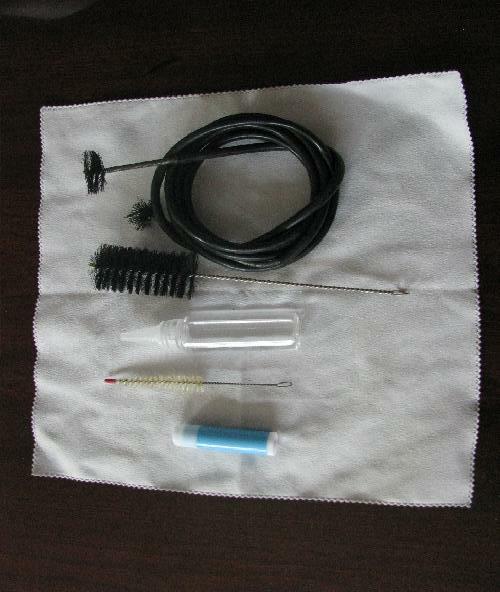 Use your snake brush to clean out the slides of your instrument. Run the snake down each slide until it comes to a stop. Do NOT force the slide all the way around a tight curve. Instead, take it out and run it in from the other end of the slide. Use a gentle brushing motion while using the snake, and rinse each slide with soapy water after brushing it. Once clean, rinse each slide and set it aside for assembly. Use the snake to clean out other tubing in your trumpet in a similar manner, including the leadpipe. Using your valve casing brush, clean out the valve casings (where the valves used to be). Use an up-and-down motion to clear out any loose particles. Be VERY careful not to scratch the surface of the interior as the valves will not work properly without a tight, smooth valve casing. The last step in the cleaning process is to clean your mouthpiece. Insert your mouthpiece brush into the shank, or back side of the mouthpiece (not the end you blow in). Gently twist it and push forward until you can just see the tip of the brush coming through the bottom of the mouthpiece cup. Continue to twist the brush while pulling it out again. Do this a few times and then rinse the mouthpiece and set it aside for assembly. Dry off the outsides of the pieces of your trumpet and then allow them to air dry for a while. Reassemble your trumpet following the directions in Assembling the Trumpet, being sure to add grease and oils as instructed. Remember: do NOT force anything, if it doesn’t go on easily, place it in your case and take it to school or a qualified instrumental repair person to fix it. Dry your brushes and put them all away. Wring out the towel that was soaking in the bathtub, throw towels and rags into the laundry, and put the plastic cup and dish soap away. Make sure to dry up any puddles you may have left on the floor in the bathroom and return the bathroom to better than usual condition (it’ll make Mom so much happier). Enjoy the feeling of a clean, clear-sounding instrument. How Much Smarter Are You for Listening to Music? Welcome to Capitol School Music Ensembles!